It is reported by the Department of Information of the Ukrainian Greek-Catholic Church. The meeting is attended by the leaders of the Catholic bishops of all European countries, as well as Turkey, Cyprus, Israel, and Kazakhstan. Ukraine is represented by the Patriarch of the UGCC Svyatoslav (Shevchuk), Archbishop Mieczysław Mokrzycki, Head of the Conference of the Roman Catholic Bishops of Ukraine, and the Bishop Milan (Shashik), the Ruling Bishop of the Mukachevo Greek Catholic Diocese. In his speech, His Beatitude Sviatoslav emphasized that solidarity which as a mighty force of civil society in Ukraine was manifested in all its glory during the Revolution of Dignity. It became a fundamental European feature of our people. “Solidarity, that is, the ability to experience the suffering and needs of the neighbor as one’s own, united people of different Churches, religions and nationalities, and marked the death of a post-Soviet society and the birth of a European nation of a European-type based on respect for the dignity of each person and the desire to build a free and independent state,” stressed the Head of the UGCC. He noted that solidarity allowed our people to resist the Russian aggression. 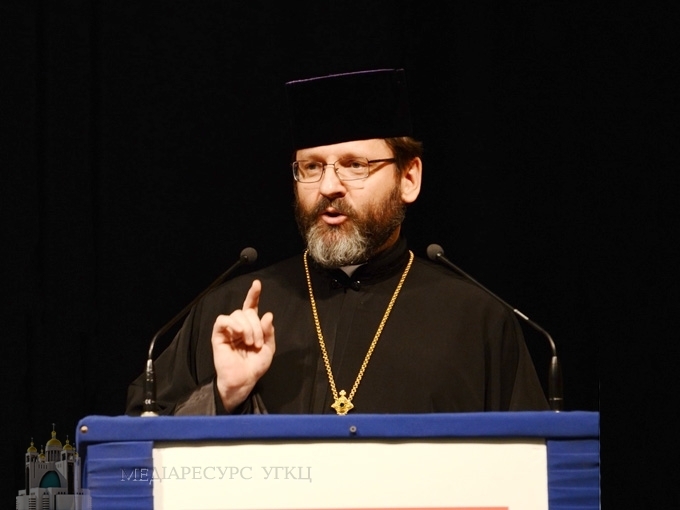 “This very solidarity, in the midst of a deep economic crisis, has made us capable of helping nearly two million internally displaced persons and overcome a deep, war-caused economic and humanitarian crisis that can be called without exaggeration the greatest humanitarian catastrophe in Europe after the Second World War,” said the Head of the UGCC. Patriarch Sviatoslav thanked the European bishops for solidarity with Ukraine in this painful historical moment, for prayer, diplomatic and economic support, for opposing Moscow propaganda by spreading true information about the war in Ukraine.